The Jesuits will stop at nothing to gain world power. They murdered Barack Obama and replaced him with an automaton. They murdered Hillary Clinton and replaced her with a Jesuit clone. Hillary's running mate in the 2016 US Presidential election is a Jesuit. Donald Trump, like Abraham Lincoln, is up against the Jesuit-controlled establishment in both major political parties in the US. Jesuits controlled Bill Clinton. Jesuits controlled George W. Bush. 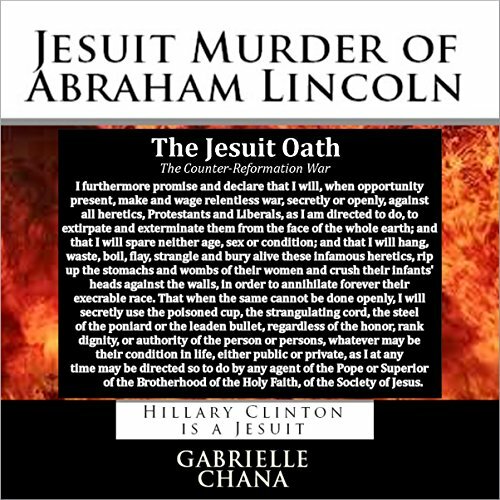 Jesuits murdered Barack Obama and have corrupted his automaton (android) and frequently use a Barack Obama Jesuit clone to make appearances. Donald Trump, like Lincoln, is surrounded by Jesuits, even in his own party. Let us pray and hope, that the real Donald Trump will emerge victorious against the Jesuit Empire. There seems to be some authentic 19th century history here - seasoned with some 21st century insanity. Perhaps this is the safest way to present the material. Or maybe the author is just nuts. Fortunately, it's an entertaining kind of nuts.